It’s been a while since we’re posted any news so here goes. Dry weather, after much rain, is making for a lovely autumn at the farm. 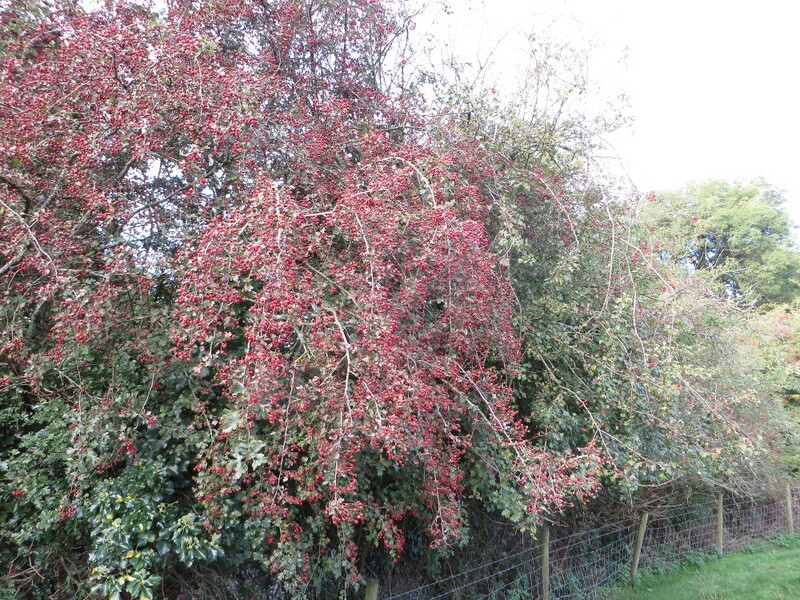 The trees and shrubs are laden with berries and fruit and there is fresh grass for the sheep. Crackle is expecting again, and is due to farrow early in November. After the unfortunate events of her last litter she’s been (if it’s possible) even better looked after this time – so far she looks to be in tip top condition. Windfall apples (one of which she is waiting to catch in the picture) are a great favourite of hers. We will keep a close eye on her over the next month. The last three pigs from her last litter are nearly ready to go to be, well, turned into meat. 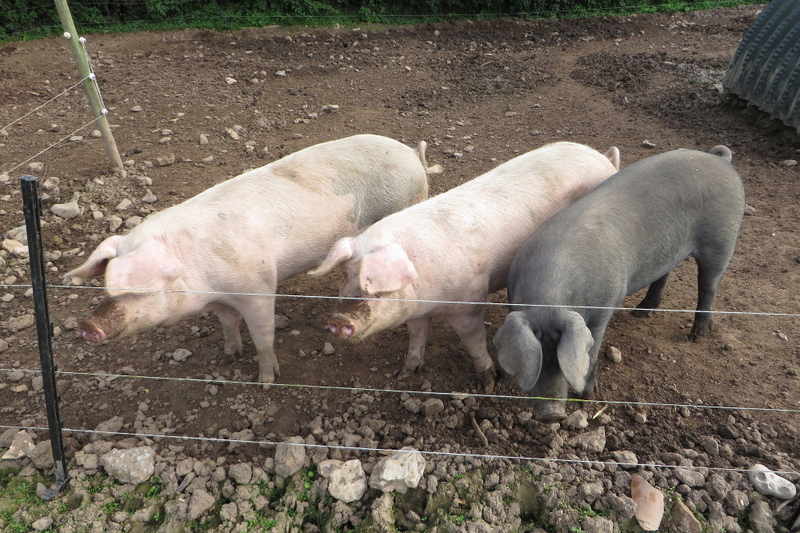 The ‘sire’ of these pigs was a rare breed ‘large black’ – such pigs tend to be rather more fat covered and less muscled than ‘improved’ breeds. 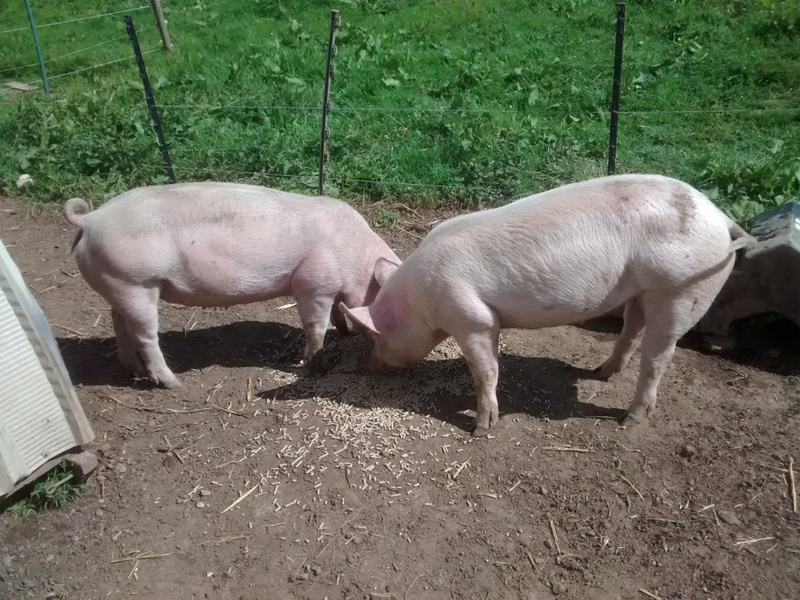 Look carefully at the two photos at the end of this post and you can see subtle differences between the three and two pigs from more ‘improved’ stock that we reared some time ago. 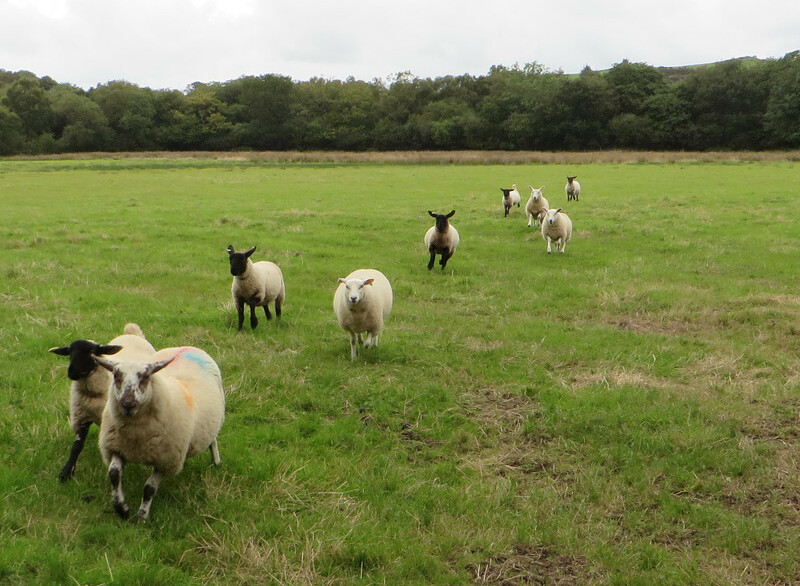 Our 8 ewes that were put to the ram produced 16 lambs this year, a ‘lambing rate’ of 200, and reared 16 lambs, a ‘lambing percentage’ of 200 – or an average, in both cases, of two lambs per ewe. 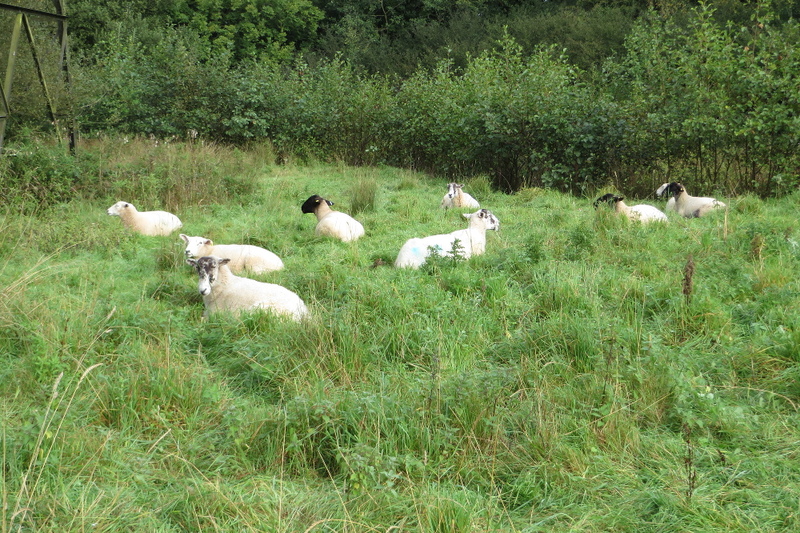 Any commercial sheep farm would be delighted to achieve such results – but a farm with thousands of ewes simply can’t put the time and care (mollycoddling even…) per animal in we do. Nevertheless many sheep farms have a lambing percentage of 170 or more. We are just starting to take batches of lambs to the abattoir. Lamb prices are lower this year than last, but we have more to sell and our rearing costs should be down (we’re learning more and getting better at shepherding each year) so we may make a small return. In the poly tunnels the poorish summer meant it’s not been a good year for heat loving plants (melons, cucumbers, water melons) which pretty much failed to produce anything, but the tomatoes are still producing heavily and will probably continue to do so until the darker days, and more likely, dampness of later autumn is too much for them. 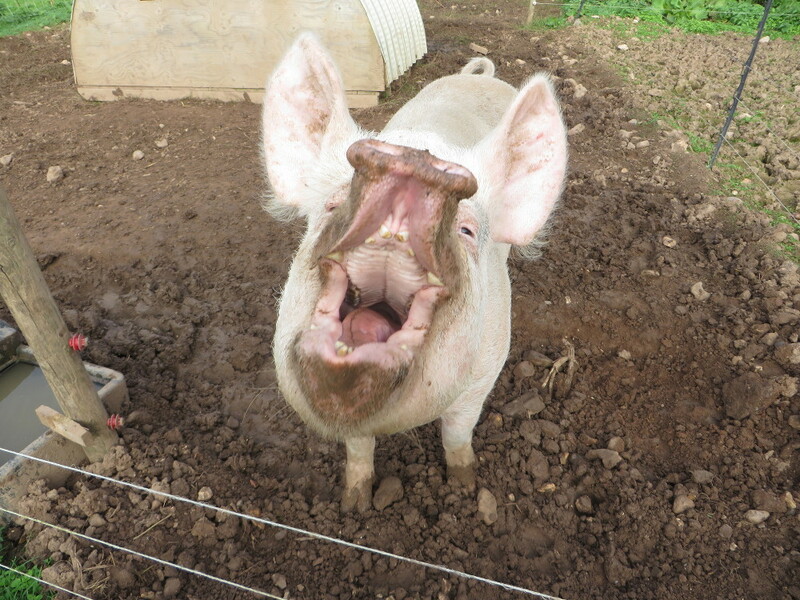 This entry was posted in pigs, sheep and tagged Pigs, Sheep by abbrookfarm. Bookmark the permalink.